Tamales hold a special place in my foodie heart because they are naturally gluten-free and are endlessly versatile in regards to toppings. Last month at the Natural Products Expo East, I discovered the Tucson Tamale company, whose diverse line of tamales are all gluten-free. Unfortunately, only one tamale they were sampling was both gluten and dairy-free (the blue corn and veggie) at the show. 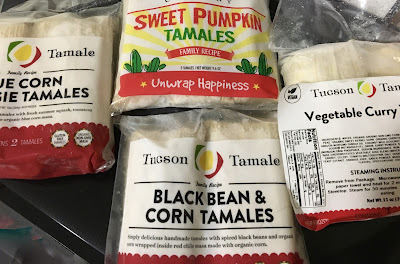 When Tucson Tamale Company reached out offering to send me a wider range of gluten and dairy-free tamales to try, I did not hesitate and eagerly agreed for the chance to check out their other tamale offerings. The assortment they sent me really showcased the versatility of tamales ranging from traditional to more exotic flavor combos such as curry and pumpkin. 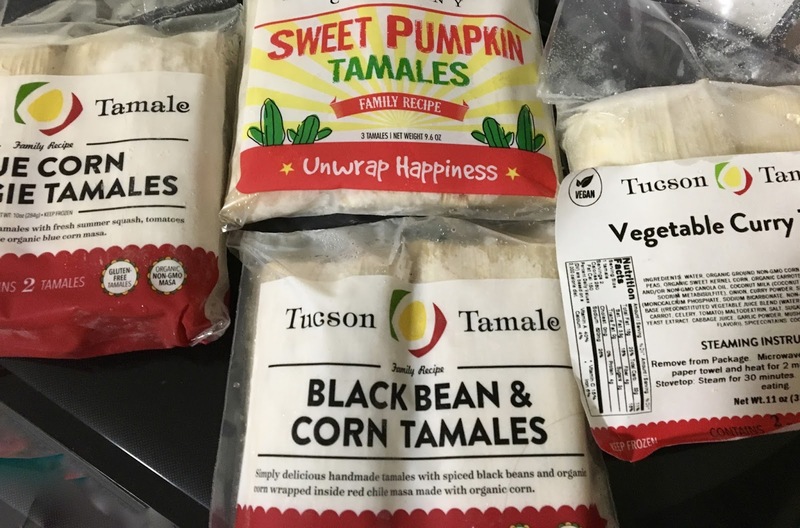 Tucson Tamale Company is a multifaceted company that offers tamales through their restaurants (in Arizona only) and through retail outlets (online and brick and mortar). Distribution in brick and mortar stores is pretty limited on the East Coast with only one store stocking them in Maryland (Roots Market in Clarksville). The best bet for buying them for those not in the distribution area is online ordering through the company's website. 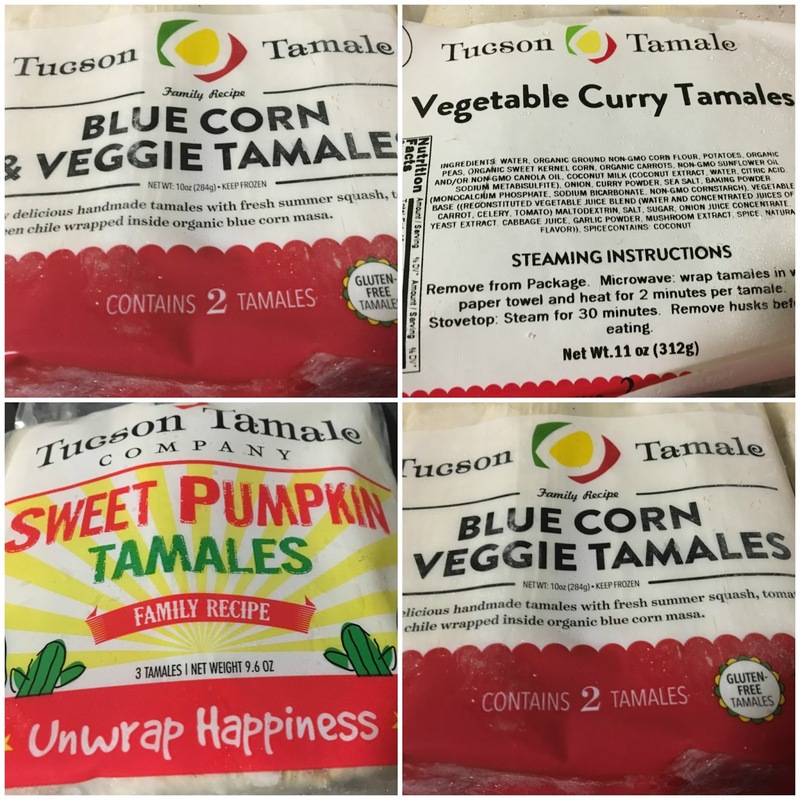 Tucson Tamale Company makes 48 types of tamales, all of which are gluten-free, GMO free and lard-free. The tamale types range from meaty to vegan and breakfast tamales to dessert ones. Tamale lovers, take note, this is a one stop shop for the tamale combination of your dreams. I received the vegan sampler, which includes two packs of blue corn and veggie tamales, two packs of the vegetable curry tamales, one black bean and corn tamale, and one soyrizo tamale. Because I do not like soy-based meat substitutes, I requested to switch that tamale pack out for the seasonally available sweet pumpkin tamale. I froze my tamales immediately upon receiving them, and they only needed five minutes in the microwave wrapped with a wet paper towel to bring them to life. The tamales can be refrigerated, but the freezer does extend shelf life. 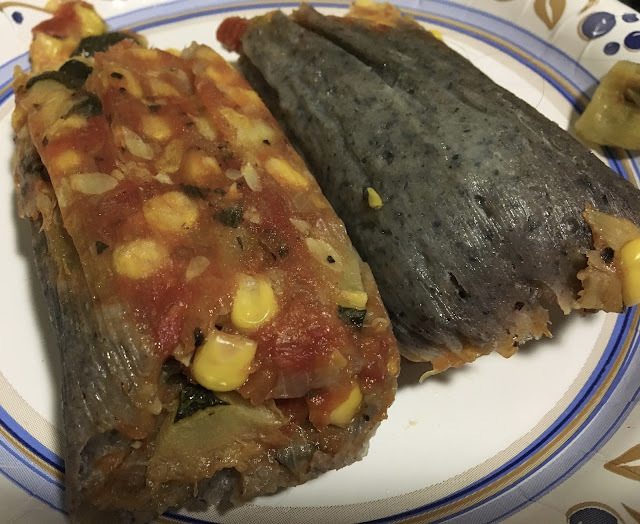 What's striking about these tamales is that they are untraditional in their coloring- they use blue corn mesa rather than the traditional yellow variety. Stuffed inside the tamales is combination of tomatoes, zucchini, onion, and chilis to make a flavorful and mild tamale. I liked how the filling was in greater abundance than the mesa wrapping, which is too often a mistake of other tamales- too much mesa, not enough filling. The vegetable curry tamales were an experiment in adding Indian flair to the traditional Mexican culinary creation. 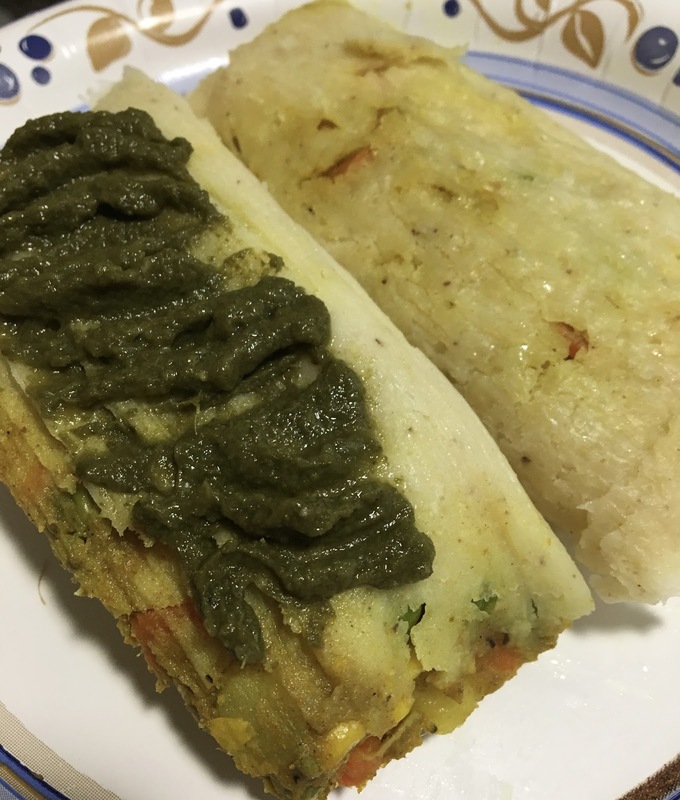 In this tamale, potatoes, peas, corn, and carrots were joined by a mild yellow curry sauce made with curry powder and coconut milk. The flavors here focused on the complexity of flavor rather than the degree of spiciness, which makes them definitely a memorable take on tamales. I topped mine with cilantro chutney which added a little bit of heat that complimented the wonderful flavor of the filling. The most novel of the tamales I was sent was the sweet pumpkin ones, which I admit I was a little skeptical of going in. I am used to my tamales being savory, so to have a sweet flavor combo was a test of my tastebuds. 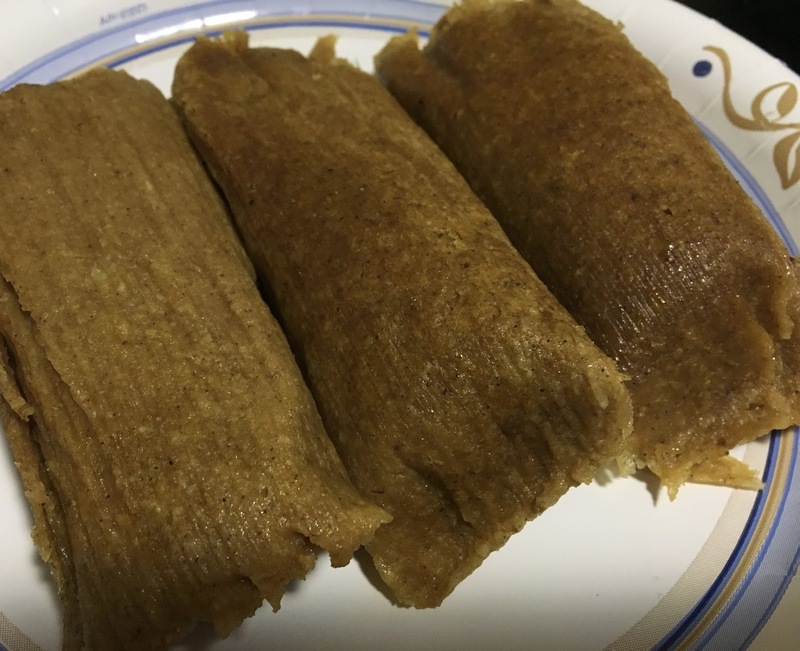 I am happy to report that these tamales passed with flying colors because they perfectly channeled the perfection of pumpkin sweetened with brown sugar. I actually ate these tamales for breakfast one day and loved how out-of-the-norm they were and how much of a treat they were. As an extra special treat, I topped them with ground cinnamon to add a little bit of spice to the sweetness. 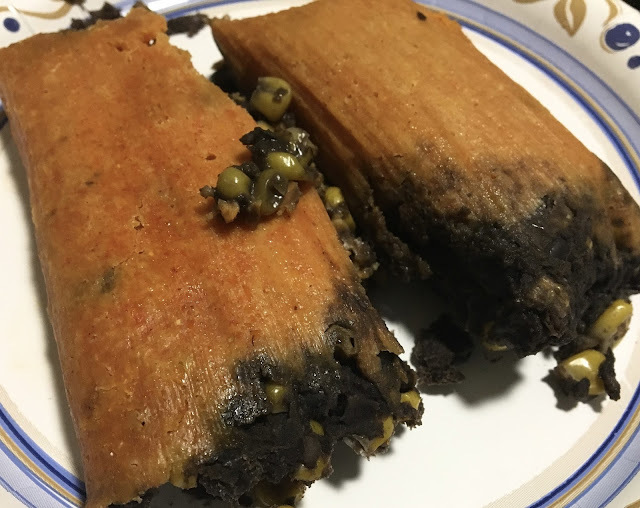 The black bean tamales were the spiciest of the tamales thanks to red chili paste, and the most traditional in formulation of the batch, as they were stuffed with black beans and corn kernels. They were the heartiest and heaviest thanks to the abundance of plant-based protein, though they were the least impactful, falling out of spotlight when compared to the other three varieties I was sent. Tucson Tamale Company definitely has taken the tamale game to new heights, and impressed this tamale lover with their line up of vegan tamales. I had no idea that tamales could be a dessert or have Indian flair, and love that Tucson Tamale Company thinks outside of the box when it comes to flavor combinations. After eating through the sample batch I was sent, I have already begun planning when to place another order online. It is truly incredible that these restaurant-quality, authentic and innovative tamales can be delivered right to your doorstep (though I would be thrilled if local stores near me in Maryland could stock them too!). Disclaimer: This review is current to the original publication date. Updates will be noted. Ingredients and manufacturing processes can change without notice. Each product should be reviewed for individual nutritional needs. Feel free to to contact me with any questions or comments. Tuscan Tamale Company sent me samples free of charge for review purposes, but the review is a reflection of my personal opinion.